Today, June 28th, CMON Limited announced it has acquired the rights to the critically acclaimed board game The Grizzled from Sweet Games. Designed by Fabien Riffaud and Juan Rodriguez with art by the late Tignous, The Grizzled originally debuted as Les Poilus in 2015 as published by Sweet Games, with CMON’s English edition premiering the same year. The Grizzled has appeared in over eight languages around the world, and, in 2016, spawned a successful expansion, The Grizzled: At Your Orders!. The designers, Fabien and Juan, will continue to work with CMON to provide fans of the game more content and enjoyment for the life of the game. An expansion, The Grizzled: Armistice Edition, is currently in development, and will add a campaign mechanic, further expanding an already beloved title, giving more structure to the story of friends surviving World War I.
Fabian Riffaud explains, "The success of The Grizzled, especially in the United States, is thanks to CMON. Naturally, entrusting them with the game and the future release, The Grizzled: Armistice Edition, was an easy choice.” Juan Rodriquez adds, “CMON supports us in our work and shares our enthusiasm." The Grizzled was recently recommended for the 2017 Kennerspiel des Jahres. The base game and first expansion are currently available for purchase, and more news on The Grizzled: Armistice Edition will be available in the future. 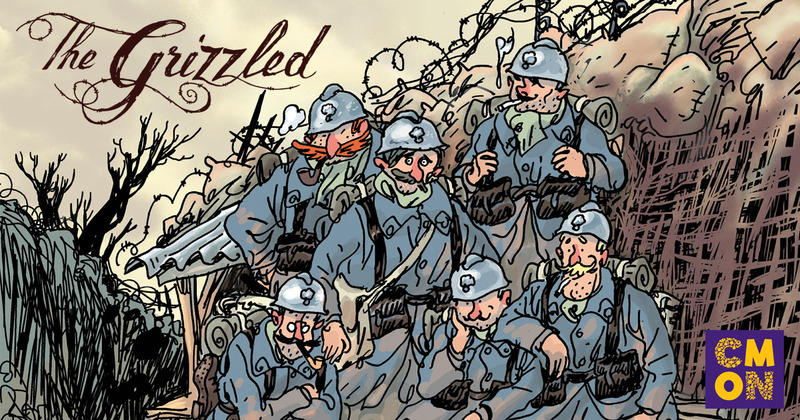 The Grizzled is a fast-paced, fully cooperative card game for 2 to 5 players that takes place in the trenches of World War I. The Grizzled is an elegant game of avoiding threats and leading a team, and is regarded as one of the finest cooperative games ever made. Featuring beautiful art by Tignous, the visuals of the game are a perfect complement to its message of peace and enduring friendship. Planning, teamwork, and a little luck are the tools needed to win this cooperative game.